There are so many exciting new fruit varieties to try. It seems like something new is always coming out. But it’s also just as fun to try some of the really old varieties, such as the Sheldon pear. This pear is native to Wayne County, New York. 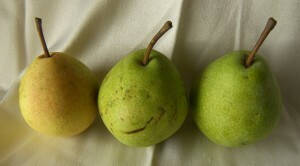 The pear is named after those who first grew it, the Sheldon family. The tree was developed from the seeds of a pear tree the family picked up in Virginia. The tree that they grew bear fruit that become popular. The original tree is said to still be at the family homestead. I purchased my Sheldon pears earlier this month at the Ann Arbor Farmer’s market. Overall Feeling: A relatively juicy pear is the Sheldon. The texture was firm and slightly grainy. The flavor was good. Not my favorite pear of all time, but still a good option. All the pears I bought were relatively on the small side, which makes sense, since Sheldon are typically an October pear. The people I bought them from said, they were starting to drop off the trees, so they had to pick them. Hi All, I found the larger fruit tastier than the smaller fruit.